As a little girl, I never liked whole cranberries and on Thanksgiving I always preferred the canned jellied cranberry sauce over the fresh cranberries my mom or my aunt made. Now that I’m a bit older and my palate is a little more refined, I prefer to make fresh cranberry sauce for my Thanksgiving dinner. In fact, it’s probably my favorite part! I’ve been known to make tortas de pavo topped with arándanos the whole week after Thanksgiving just to have an excuse to keep eating them. This recipe has been passed on through two generations in my family, and now I’d like to share it with you. 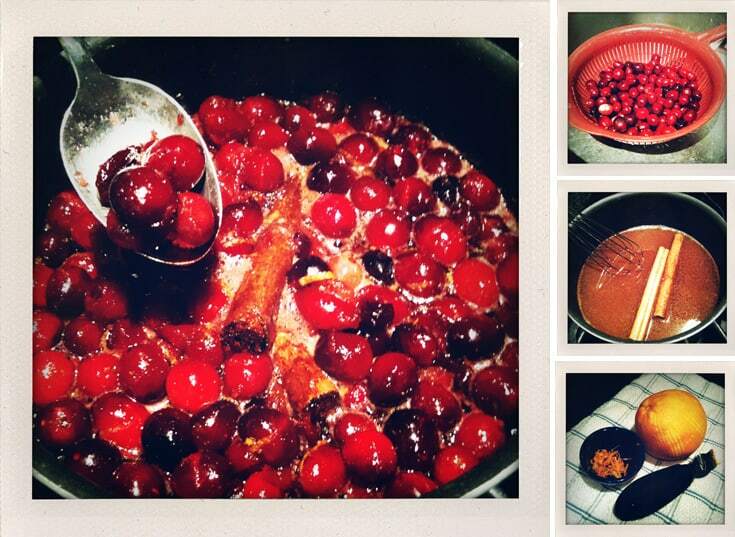 If you’ve ever been afraid that making cranberry sauce from scratch would be too difficult, you’re in good company. This recipe, though, is so easy that you won’t believe you didn’t try making your own with fresh, whole cranberries sooner. From start to finish, it takes about 15 minutes and it’s a perfect balance of spicy and sweet. These are great for Thanksgiving or La Navidad, too. The Mexican cinnamon gives it a more subdued, woody cinnamon taste than traditional cinnamon sticks you find in grocery stores in the U.S. but you can also use those if you can’t find the Mexican kind. José didn’t grow up celebrating Thanksgiving since it’s not a Mexican holiday, so we do a traditional – mostly American – Thanksgiving in our home. He’s particularly fond of pumpkin pie with homemade whip cream, actually. But I hear from my cuñada that our Tía Annette, la otra gringa de nuestra familia Mexicana, likes to serve a fresh cranberry dish during the holidays similar to mine. She’s one of several grand cocineras in our family, and has a killer recipe for pumpkin cheesecake that I’ve been dying to get my hands on. Today, I’m thankful for the love from my husband, our families and friends, and for all of you readers who allow me into your kitchens to teach you a little bit about authentic Mexican food and culture. Thank you all from the bottom of my heart – your comments here, on Twitter and on the Facebook fan page bring me more joy than you’ll ever know, and are a constant reminder to me why I continue to write about my passion for Mexican food and culture. May you have a beautiful holiday season with your loved ones. Rinse the cranberries in a colander under cool water. Combine everything except cranberries and orange zest in a sauce pan. Bring to a boil. Cook over medium heat and stir until syrup is clear, about 3-4 minutes. Add cranberries and stir occasionally until they begin to pop. Remove from heat and add orange zest. Bring to room temperature, transfer to a glass bowl, cover & refrigerate. This recipe can be served warm or cold and tastes even better the day after it’s made. Yields 2 ½ cups. Can be stored in an airtight container in the refrigerator for up to 10 days. How do you like your arándanos? The photos in this post were taken with my iPhone 3Gs using the ShakeItPhoto app by Banana Camera Co.
We make ours the SAME way!!! The only difference is that we use whole cloves. YUM!! !